Are DNA Tests to Discover Your Ancestry Really Safe? Canada Pharmacy Online > Blog > Are DNA Tests to Discover Your Ancestry Really Safe? In recent years, and as technology progresses, modern culture has seen a dramatic rise in the popularity of DNA testing kits. 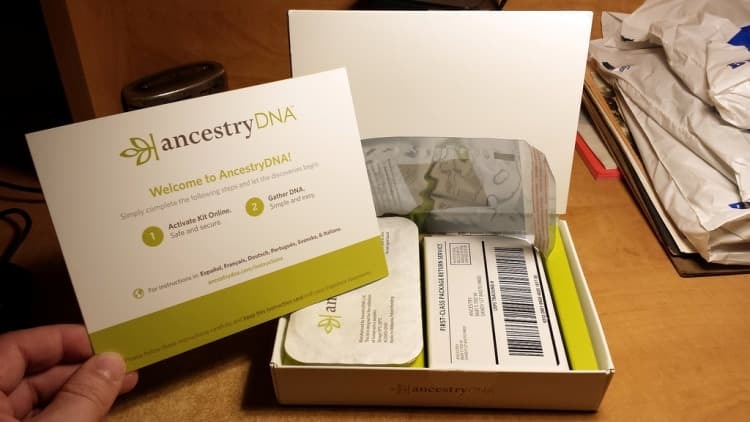 Heavily advertised, the number of people taking these DNA tests doubled in the year 2017 alone..
People enjoy taking these tests in order to find a window into their ancestry. Don’t you want to know exactly where you come from? The appeal of taking an ancestry test is hard to deny. You may uncover family secrets or simply discover a bit more about who you are and your heritage. The tests are so advanced now that they can even provide a window into your health, telling you if you are susceptible to certain diseases or carrying genes that may protect or harm you in the future. They can tell you if you carry certain genetic receptors for illnesses or predisposition to certain cancers, or simply more about how your body works the way it does and what conditions you may have or contract one day. Clearly, the deeply revealing information these tests can provide, medical and otherwise, is attractive to our curious minds… and that’s part of the problem. Once you take the test to find out everything there is to know about you based on your unique and irreplaceable genetic code, you’re not the only one with access to that information. Your DNA holds the key to your sensitive personal details that you may or may not want others to have access to. This is where things can get a little questionable. Keep reading and we’ll explain more about the potential risks behind taking a DNA test like Ancestry, 23andMe, or MyHeritage. What are the risks of taking an ancestry DNA test? Here’s the short version: these ancestry kit companies are keeping all of their customers’ DNA stored and selling it to big pharmaceutical companies. A company having a copy of your DNA on file, for any purpose, should concern you. What if it is mishandled or used in some way that you did not permit? What if it is stolen, sold off, or used for sinister purposes? What many people don’t realize is that once you submit your sample, the company now owns your DNA. In other words, they can do whatever they want with it -- sell it, distribute it… Even after you die, these companies can still access and use your DNA that they have kept on file. This may sound like the plot of a scary sci-fi film, but it’s already happening. GlaxoSmithKline, or GSK, is a major pharmacy that entered into a partnership with DNA testing company 23andMe in July 2018. 23andMe provided GSK access to the genomes of five million of its customers -- in exchange for a cool $300 million. In other words -- yes, those testing kits are expensive. But that’s not really where these companies are making their money. It’s in the selling of the DNA they collect. Now, it’s important to note that sharing your DNA for medical research is often an option provided to customers by these genetic testing companies. During the checkout process, customers of some DNA testing companies can decide either to opt in or opt out to this use of their DNA (though the company does own the DNA regardless). Many times, though they are available, the disclosures or terms of service are difficult to find or interpret. However, even when such an option is offered, there’s great risk for this portion of the agreement to be overlooked, and it’s safe to say that in most cases, people don’t realize what they’re truly agreeing to. If they’re unaware of the risks associated with this choice, they may just mark yes because it seems like the noble or decent thing to do. In addition, these customers likely don’t realize that the DNA companies are then making a profit off of their customers by reselling the DNA they collect. It’s likely that if more people realized their DNA was actually being resold for medical research, they might think twice before offering up such valuable intel for free. Currently, there are no regulations requiring these companies to ask the customer whether they want to share their DNA. In other words, while people are involved in medical research through the use of their own DNA, they unknowingly commit to helping scientists find a cure or create a new medicine -- for free -- which can then, later, hit the market at a price they can’t afford and therefore won’t be able to access. So people may be involved in finding a cure for diseases that, if successful, they later won’t even be able to afford. And all of this they actually paid to be a part of by purchasing the DNA kit! At the end of the day, what makes the testing kits so risky is the fact that by providing a sample of your DNA, you are essentially handing over a copy of everything about you. You’re providing it to a large for-profit company, no questions asked, for them to analyze for your interests and then use as they wish. They have a perfect clean sample of your DNA and they store it indefinitely. What do insurance companies want with my DNA? Pharmacies and insurance companies want the medical records of such large populations of people so that they can use it for research and development. Imagine if they were able to know what conditions and illnesses millions of people were predisposed to; they’d be able to use this information to help better invest research funds, predict demand, ensure adequate supply, and more. Many people are concerned that if insurance companies know a person is predisposed to one disease or another, they would refuse coverage. That’s another point where access to your genetic information can prove quite dangerous if it falls into the wrong hands. Some worry about a health crisis caused by inflated insurance rates (or even impossible to pay premiums or refusal of coverage altogether) for people whose DNA gives them away as a potentially expensive patient to undertake. Think of it in a dystopian world for a moment: If insurance rates rise or become inaccessible to certain groups or subsets of people due to the conditions they may or may not have (or may one day develop), this could become a serious issue. Currently, the 2008 Genetic Information Nondiscrimination Act (GINA) prevents insurance companies or private businesses from denying service or discriminating based on your DNA profile. However, there’s no way to know how this law may become threatened or enforced as technology continues to progress. It’s also worth noting that a lack of access to affordable health solutions -- whether they are pharmaceuticals or medical services -- is something we stand firmly against here at Canada Pharmacy Online. We exist to provide people with convenient, affordable access to the medications and prescriptions they need. The complexity and advanced technology of DNA testing services has another potential benefit: solving decades-old cold cases. Though this is certainly a win for justice, the situation again raises questions about how our DNA is being used after we submit it for genealogical testing. One of the most famous crimes solved in recent months which made major headlines was the arrest of the infamous Golden State Killer thanks to a DNA site. According to Vox, during the press conference announcing the arrest, it was revealed that the resolution of the case “focused heavily on DNA evidence linking DeAngelo to the crimes … the Sacramento district attorney’s office confirmed to the Sacramento Bee that authorities had submitted [DeAngelo’s] DNA, collected from a 1978 crime scene, to online websites like Ancestry.com and 23andme.com. These websites allow individuals to look up information about their genetic background by matching their DNA against publicly available DNA profiles. Lead investigator Paul Holes said his team used the website GEDmatch, which creates profiles based on voluntarily shared, publicly available genetic info. A recent article in NBC News corroborates this growing trend in using DNA testing services to solve long-puzzling mysteries. “This seemingly rapid resolution to a long-stalled murder case is becoming something of a trend: It is the fifth cold case solved by Parabon and their researcher, CeCe Moore, since early May, meshing high-tech DNA analysis, traditional genealogical work and the soaring popularity of online ancestry databases. A sixth, involving an accused serial killer in California, was solved in a similar manner. Doesn’t wider access to DNA profiles have benefits? It sounds like it could be a good thing, doesn’t it? Access to millions of DNA profiles and genetic samples so that scientists can conduct more thorough research -- even test for cures, treatments, medicines, and more? Yes, it does sound like a good thing, and it very well may be. However, with that great potential for power comes a great potential for abuse. In addition, the trick is that there’s such a thing as familial DNA matching. This means that you can be linked via the DNA of your family members. That means if any of your relatives have taken an ancestry test, you are forever linked in a database in some form or another, since you share some DNA in common with anyone you’re related to. Fortunately, recent months have seen a healthy degree of skepticism arising around these DNA testing kits. After a crime was solved simply because a distant relative of the criminal’s took one of these DNA tests, leading police to the killer (more on that below), people began to wonder how these tests could be used by law enforcement to solve crimes. Of course, while solving crimes is one of the potential positive benefits of these tests, it caused a degree of doubt in people’s minds about just how safe and protected their data is after they send their own DNA off to these companies. Popular YouTube star Kendall Rae even did a video on "what DNA companies don't want you to know" on her channel. In it, she talks about the fact that people don’t usually realize the implications of what they’re doing when they send their saliva off for genealogical testing purposes. The important thing is, as always, to do your research. The more you know, the better you can protect yourself. As more and more information emerges about the potential dangers of these tests, it’s important to know all the aspects of your privacy, safety, and rights before deciding to participate. The point is not to stop everyone from taking these tests; the point is that people need to be more informed and aware of the possible risks before they decide to take one.